In 1977 Mitsubishi designed and built two prototypes of a twin-turbofan business aircraft designated the MU-300, the first flying on 29 August 1978; a one -hour flight. A cantilever low-wing monoplane with a pressurised fuselage and retractable tricycle landing gear, the MU-300 was powered by two JT15D-4 turbofan engines, pod-mounted one on each side of the rear fuselage. Its twin turbofans are rated at 2,500 lbs. s.t. for takeoff and 2,375 lbs. s.t. for maximum continuous operation. Standard accommodation was provided for a crew of two and seven passengers. At the end of the development programme the prototypes were dismantled and shipped to the USA, where they were reassembled by the company's US subsidiary Mitsubishi Aircraft International Inc. The two Diamond I prototypes underwent 350 hours of test flying in Japan before their arrival in the United States for FAA certification. Redesignated the Diamond I, the two aircraft were used in the US certification programme, which was granted on 6 November 1981. Initial customer deliveries began in July 1982 and 62 were built. The Diamond I wing design, with its advanced flight control system of full-span flaps, wing spoilers, and T-tail empennage, is built for optimum performance. Mitsubishi developed an improved Model MU300-10 Diamond II, which was approved under FAA type certificate A14SW. 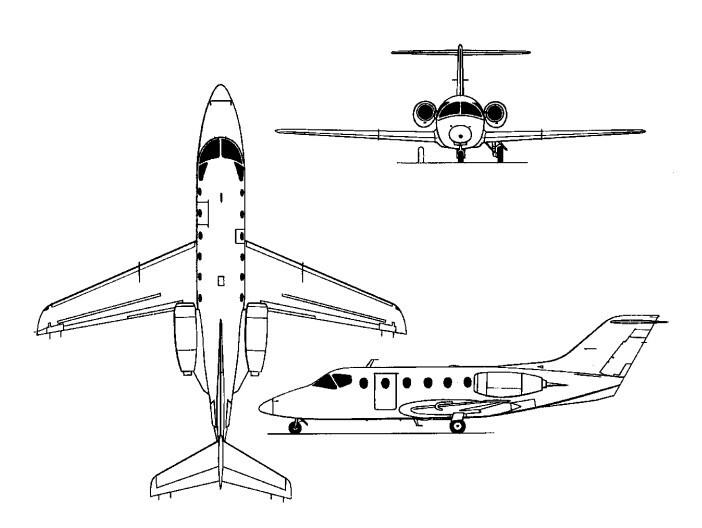 Eleven examples were produced before the program was taken over by Beech and the aircraft re-certificated as the Beech Model 400 under new FAA type certificate A16SW. All the MU300-10 were subsequently converted to the Model 400 under Beech Service Bulletin Number 2140. An improved version, the Diamond IA, fitted with uprated JT15D-4D engines giving overall performance increases, an EFIS cockpit and with maximum take-off weight increased to 7361kg, was announced in 1983 and the first of 27 built, distinguished by the extra port side window, was delivered in 1984. With an MTOW reduced to 7157kg, but with extra fuel, and more powerful JT15D-5 engines, a further eight aircraft were produced as the Diamond II. Model 400 comprised serial numbers RJ-12 through RJ-65. However, in December 1985, Mitsubishi sold the Diamond II design rights to Beech, together with components for 64 aircraft. 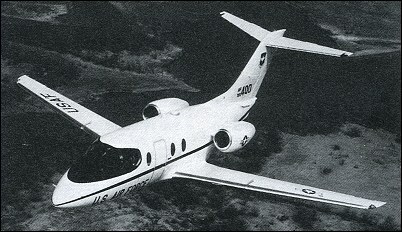 These were assembled at Wichita and marketed as the Beechjet 400. Beech then initiated full manufacture of the type in 1989. The first Beech-assembled aircraft was rolled out on 19 May 1986 and deliveries began in June. 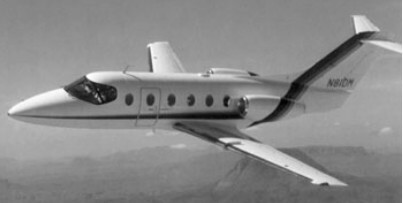 By the beginning of 1989 46 Beechjets had been delivered. Beech is also providing support for previous Mitsubishi products, including the MU-2 and earlier Diamond versions. The commercial Model 400A Beechjet was certificated on 20 June 1990, featuring increases in payload and ceiling, greater cabin volume, a rear lavatory and improved soundproofing. A Collins Pro Line 4 EFIS is fitted as standard. Deliveries of this version began in early 1990. By the beginning of 1991 beech had received orders for 113 slightly modified Model 400As In February 1990 the US Air Force chose the type as the airframe element of the Tanker/Transport Training System under the designation Beech 400T T-1A Jayhawk. Powerplants are 2,900 lb st (12.9 kN) P&W Canada JT15D-5 turbofans. The USAF requirement was for 211 aircraft and the first of these was delivered in July 1991 and entered service in March 1992, training KC-135, C-5, KC-10 and C-17 crews. In 2003 its name changed once again to the Hawker 400XP (for ‘extended performance’) for a better fit into the Raytheon family of bizjets. The Model 400A, serial number RK-1 and on, was a further development. The primary change was the introduction of the Rockwell Collins Proline IV EFIS system, plus other improvements including greater cabin volume, increased max takeoff weight and higher operating ceiling. (From 2003 and serial number RK-354 the aircraft was marketed as the Hawker 400XP.) Production ceased in 2010 with serial number RK-604. Engines: 2 x P&W JT15D-4, 2,500 lbs thrust. Maximum ramp weight: 14,200 lbs. Maximum takeoff weight: 14,100 lbs. Standard empty weight: 8600 lbs. Maximum useful load: 5200 lbs. Maximum landing weight: 13,200 lbs. Maximum usable fuel: 4200 lbs. Best rate of climb: 3000 fpm. Max pressurisation differential: 9 psi. 8000 ft cabin alt @: 41,000 ft. Maximum single-engine rate of climb: 810 fpm. Normal cruise @ 37,000ft: 424 kts. Fuel flow @ normal cruise: 1098 pph. Stalling speed clean: 104 kts. Stalling speed gear/flaps down: 91 kts. Turbulent-air penetration speed: 208 kts. Engines two 2,965-lb. Pratt & Whitney JT15D-5 turbofans. Fuel capacity 733 US gal. Long range cruise 414 kts.